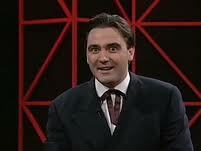 Does anybody epitomize the 1990s any more than Tony Slattery? Here’s some snaps of him strutting his stuff in ‘Whose Line Is It Anyway?’, plus one of him with a bra over his face. Just look at his cheeky 90’s face! He was even in The Crying Game. And what’s more, he was the subject of the best Viz cartoon strip I think I’ve ever seen – ‘Tony Slattery and his Phoney Cattery‘. This entry was posted in Bits and pieces and tagged film, Justin Bieber, Lacking inspiration, The Crying Game, Tony Slattery, Whose Line Is It Anyway? on February 2, 2011 by Ashley Clark. In the mid-1990s, after leaving Whose Line Is It Anyway?, Slattery suffered what he described as a “mid-life crisis” — triggered by excessive drinking and cocaine use (spending up to £4000 per week on the drug), culminating in 1996 with a six-month period of reclusiveness, during which he did not answer his door or telephone, “or open bills, or wash… I just sat.” Eventually, one of his friends broke down the door of his flat and persuaded him to go to hospital. He was diagnosed as suffering from bipolar disorder. He discussed this period and his subsequent living with the disorder in a documentary made by Stephen Fry, The Secret Life of the Manic Depressive, in 2006; Slattery claimed that he spent time living in a warehouse and “throwing [his] furniture into the Thames”.